And of course, worldwide, there’s good old Bandcamp, selling both digital and physical. If you purchase the CD/DVD from here, you get an immediate digital download to tide you over until the postman arrives! Well, the word is out. This Tuesday, my album “Last Chance To Hear” is finally being released on Bandcamp! And I’m incredibly excited to announce that one track features a very special guest vocalist… None other than William Shatner! 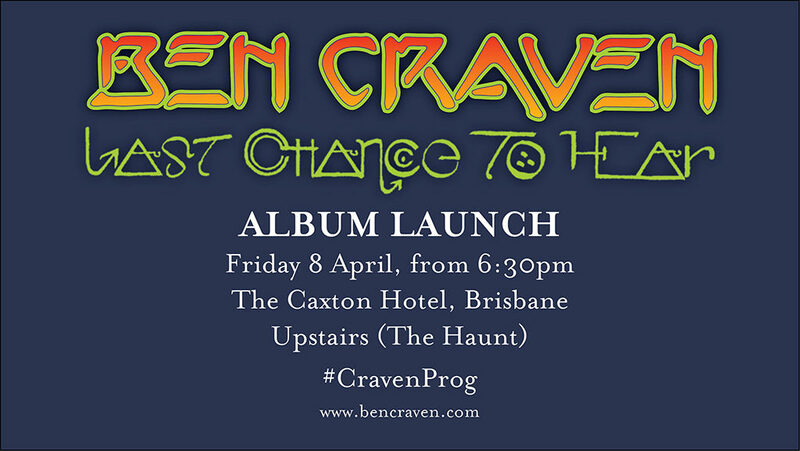 My album launch for “Last Chance To Hear” is on 8 April! Come along for a rare live performance of old and new tracks, and partake of some fine drink appreciation with me (responsibly). Well, the “Last Chance To Hear” album is now completed, the artwork almost nailed, and we’re just about ready to ship everything off for manufacture. Thank you everyone who came along on the TuneLeak journey! You will receive more information later this week about ordering “Last Chance To Hear” from my Bandcamp page, if you are so inclined. This was a fun experiment! Based on your feedback and my own experience, I’ll definitely do something similar for the next album, maybe with a couple of changes. In Part 2 of the interview I explain why I officially leaked the “Last Chance To Hear” album as it was recorded. Here is Part 1 of an interview about “Last Chance To Hear”, in which I explain some of the inspiration behind my new album. Unleashing… the opening track from my new album-in-progress, Last Chance To Hear! Appropriately titled, “Last Chance To Hear Part 1”. This is perhaps a little more over-the-top for me than usual – one part demented chat show theme and one part acerbic call to arms. Then everything goes to heck. You can listen to it (and purchase) right here. As always, the new track is available for download from the TuneLeak website. If you purchase it, you’ll receive an equal discount off the album once it becomes available. Everybody wins! Hi and welcome to the first TuneLeak for 2015! Revenge Of Dr Komodo – available for purchase here! In this new track, Progressive Rock and Rockabilly ignore the advice of their friends and spend an unforgettable night together in an unbridled fit of forbidden passion. The result speaks for itself. Revenge Of Dr Komodo is most likely the third part of a new mini-suite for my new album, Last Chance To Hear. But all those part numbers get confusing after a while, so this time I gave the track a proper name. The villainous Dr Komodo bears no relation to the otherwise similarly-manic bass player in the accompanying video. The usual TuneLeak rules still apply! If you’re kind enough to purchase Revenge Of Dr Komodo, you’ll receive the same amount as a discount off the album when it’s released. Merry Holidays and New TuneLeak! And so, the centrepiece of the new album (so far) begins. Or continues. Or concludes. Whatever. Hope you have a wonderful break, if you’re lucky enough to get one. I’ll be thinking of you all here as I enjoy a cold rum on a hot Christmas morning. Spy In The Sky Part 2 is the latest track sort-of-completed from my album-in-progress, Last Chance To Hear. Part 1 has already been leaked. Part 3, the extended finale, is wrecking my head as you read this. Part 2 is the big transition. Prepare to be shocked by my first-ever use of drum machine samples and hints of electronica! As always, the usual TuneLeak deal applies. If you’re kind enough to purchase the download, you’ll receive the amount you spend as a discount off the album when it’s finished.